I've mentioned before that one way my life has changed a lot is that I've gone from exercising in a gym (primarily an elliptical machine and stationary bike) to exercising outdoors. It makes my workouts more weather-dependent, which is an adjustment I've still not quite adapted to. (I might even call the nearby gym to see What their rates are). In the winter, it's not that bad, since snow is easier to walk/hike/ski in than rain. But when it's a blizzard or rain that goes on for several days, I'm relegated to an indoor, sedentary life. Another adjustment in this lifestyle is that I used to be able to read and read and read while I worked out. Working out 1 1/2 to 2 hours a day, I could read one or more books a week. But the inability to read while hiking or skiing has put a damper on my reading. The only option is to find audio books, which is a long way to introduce my topic today: Archetypes. As I hike, I've been listening to Caroline Myss talk about Archetypes. It's quite interesting, and a good follow-up to my recent discussions about the Mexican Fisherman. How? You may ask. The Archetypes tell us a lot about ourselves. Not only our personality, but our purpose. They tie to our soul contracts; our reason for being here. The lessons we're here to learn and the accomplishments we're here to fulfill. I went online today and found a quiz to determine your archetypes. They're not exactly the ones Caroline uses, but it's a good start and a fun, insightful and easy quiz. 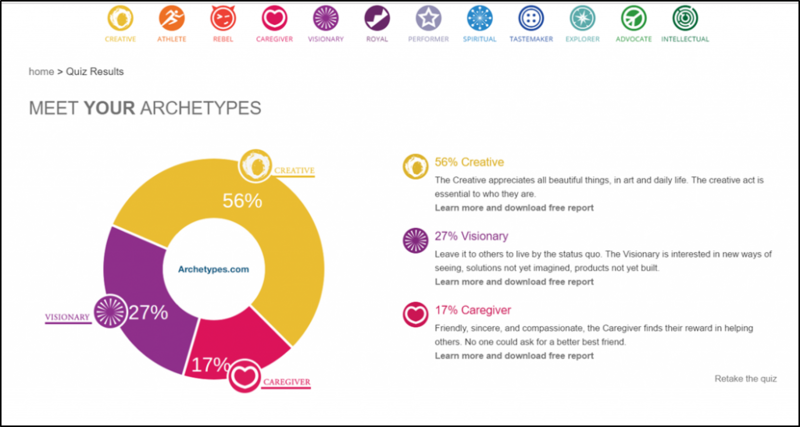 http://www.archetypes.com/ My results came back, and here they are: 56% Creative; 27% Visionary and 17% Caregiver. Okay, that fits. It explains how I want to do big, creative, breakthrough things that help people. Works for me! (My only problem, as you may have surmised by now, is getting the world to see it that way, too. Hmmm). The "other expressions" of the Visionary archetype include: Entrepreneur, Innovator, Pioneer, Guide, Dreamer, and the "Life Journey" is "To bring the future into the present, and sense the changing impulses of society." Uh-oh. No wonder I'm so affected by what's going on in the world today. Further in this report, it shows more about each archetype. I'll get into that tomorrow.